Big debate for the evening was whether to ring in 2013 with an old favorite (i.e., a Buena Vista Pinot Noir as we did last year) or a new Bordeaux favorite…either possible just because we decided to hold the champagne for New Year’s Day. 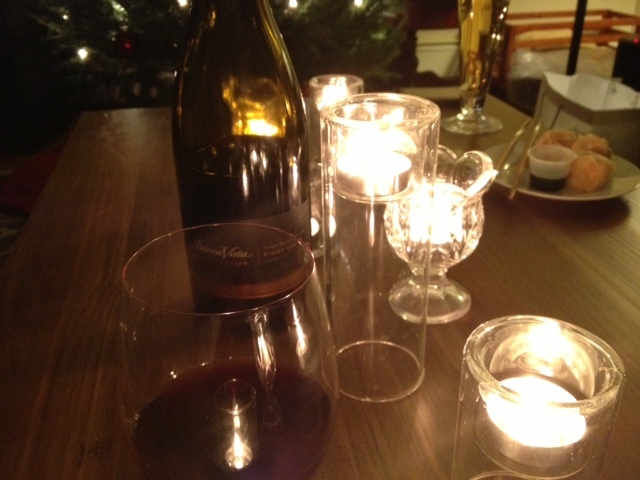 After some waffling, it was the pinot that made the cut–specifically the 2008 Buena Vista Swan Selection Pinot Noir. I uncorked it while enjoying some monstrous shrimp shumai, continued to savor it with some delicious steaks and potatoes (pan seared to perfection), and ultimately polished it off after dinner. Make no mistake; this baby was dry long before the ball dropped at Midnight. 2008 Buena Vista Swan Selection Pinot Noir, Sonoma County, California, USA. Now, I can’t express all that headsy analysis but I can confirm it. Seems like a very appropriate description of a fun drink. Buena Vista has always been great and this is no exception.